Susan Sontag was a writer, philosopher and activist. She was born in 1933, did some stuff, and died in 2004. During that “doing some stuff” phase, she was politically outspoken with a brand that has since become the archetypical caricature of leftist nut jobs. In the 60’s, Sontag described the “white race” as the “cancer of human history”. And after some blowback, rephrased what she’d said because it was unfair to cancer patients. Ouch. Sontag took a lot of heat, mostly for her unpopular criticisms of western culture. But, also, probably because she was a provocateur and seemed to enjoy getting under more conservative, or at least non-committal, skin. She had plenty of good points, but failed to deliver them for the whole audience—or, more likely, never intended to. From a modern perspective, I call that failure. From a historical perspective, activism on the left probably needed the jump start in order for some important discussions to finally happen on a large scale, and Sontag’s diverse body of work did likely push that ball foreword. Sontag wasn’t an armchair activist though, she did actually pick up her boots and visit conflict zones, such as Vietnam and the Siege of Sarajevo. It wasn’t a social media world out there yet, and her thoughts and theories were born out of her own experience. Although her works were frequently controversial, her influence is no longer up for much debate. The New York Review called her “one of the most influential critics of her generation”. Especially as far as photography is concerned; pick up virtually any book on photography and you’ll find authoritative references to Sontag’s philosophies. 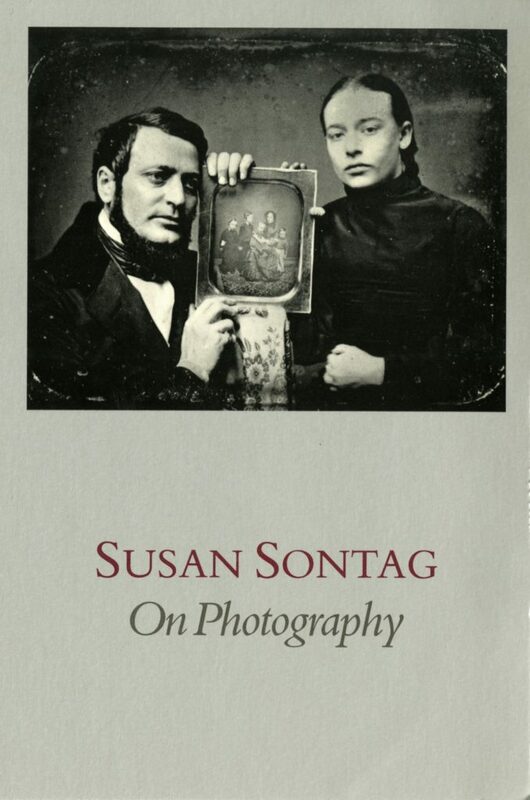 On Photography, which is a collection of essays by Susan Sontag, is among her most well known works and highly influential among the photographic community. She’s made lucid many of the lingering questions about photography as an art—or a fine art—and helped place that in a larger context with painting. Where painters were seeing “picture making machines” overtaking them, Sontag joined lesser known voices noting that photography actually freed the painter’s artwork. The historic work of painters was to try and faithfully reproduce reality—but that’s only a modicum of what a painting can be, and a tall order for any painter. It’s also the fundamental thing photography does nearly flawlessly. With photographs taking over the task of faithful reproduction, painters would be free to interpret instead. Of course, as Sontag notes on multiple occasions, photography didn’t conclude paintings pursuit of faithful representation, and photography was not relegated to it. Instead, Photography took to task what painting, generally speaking, would not. The representation of the inane, the benign; junk, dilapidation, the poor, and the misfits. The “truthfulness” of photography ushered in a kind of tragedy tourism and a theft of autonomy, cloaked as art. It was, as Sontag says, an “act of aggression”. Where a painting would come from the mind, a photograph was like stealing something from the real world, and from the people unaware of what was being taken from them. Among the most interesting parts of this work, for me, was the discussion of how picture-making has fundamentally changed the photographer’s view of the world around them. She says, “Certain glories of nature…have been all but abandoned to the indefatigable attentions of amateur camera buffs. The image-surfeited are likely to find sunsets corny; they now look, alas, too much like photographs.” Where the strokes and shades of a sunset’s painting keep the artist coming back, a photographer becomes blind to the actual beauty in front of them. I relate. On Photography is must-read literature for anyone wielding a camera with an intention to capture more than a fleeting selfie or their dog acting silly. There are layers of philosophy, not just about photography, but about art in a larger context, that is a lifeblood for an authentic, intentioned artist. Practically speaking, On Photography is a little hard for modern audiences to read. The essay format of the book means the chapters are long. No action steps or instructions for anything is included. There is no clear point. But the point will become clear through the viewfinder of the camera, as the photographer sees not just the shapes, but what those shapes mean and what implications there are in capturing them. The book is for the thinking, feeling, acting photographer. And not merely for the picture maker.